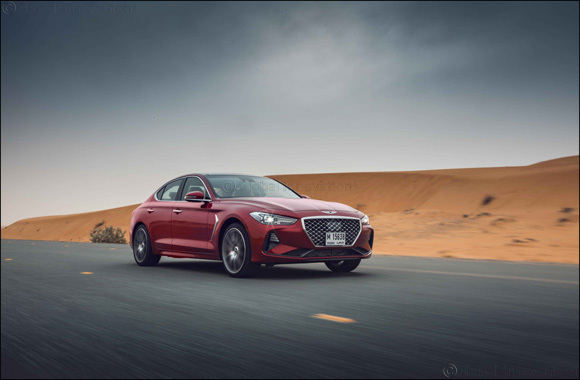 Dubai, UAE, April 16, 2018: Genesis has officially launched its compact G70 luxury sedan in Middle East markets, completing the ambitious brand’s core sedan line-up. Engineered as a dynamic car with strong appeal to younger customers and more enthusiastic drivers, the G70 joins the flagship G90 large sedan and mid-sized G80 and G80 Sport, once again demonstrating the commitment to excellence and authenticity that underpins the world’s newest luxury auto brand. The Genesis G70 is the latest representation of the brand’s rapidly evolving DNA, with its graceful and dynamic exterior styling, elegant and intuitively designed interior, and choice of two different powertrains: turbocharged 3.3-liter petrol V6 and 2.0-liter turbocharged petrol I4. The arrival of the Genesis G70 in showrooms follows a previous display presentation at the Dubai International Motor Show in November 2017, where Genesis fielded a large number of enquiries about the car. With larger G80 and G90 models already growing a strong base of loyal customers, it is expected the compact model will add significantly to the brand’s appeal in the competitive Middle East luxury car market. The all-new G70 showcases the future direction of the Genesis brand’s ‘Athletic Elegance’ design identity. This visual philosophy is represented in the exterior styling, capturing the essence of the Genesis DNA to bring to reality a superbly crafted sports sedan.